Penal Reform International (PRI), Kyrgyzstan’s State Service of Execution of Punishments and the UN Office on Drugs and Crime (UNODC) last month jointly organised the country’s first international Penitentiary Forum. 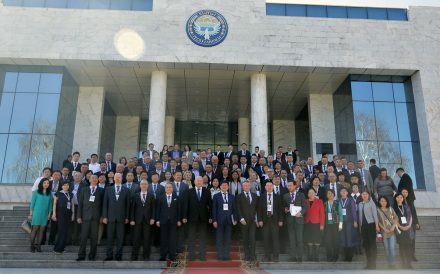 The aim of the forum, which took place in Bishkek from 28-29 March 2017 and which was supported by the British Embassy, was to create a practical dialogue platform where multiple countries could convene to discuss best practice regarding rehabilitation/resocialisation and employment of prisoners after their release, effective functioning of probation services, and ways in which to reduce prison populations. Read PRI’s short guide to the Nelson Mandela Rules or watch an animated introduction. The guide summarises the Standard Minimum Rules for the Treatment of Prisoners, which were revised in 2015. Rule 90 of the Mandela Rules emphasises that released prisoners should be supported to lessen stigmatisation and assist with social rehabilitation. Rule 4 outlines the purposes of imprisonment, which are primarily to protect society against crime and to reduce recidivism.